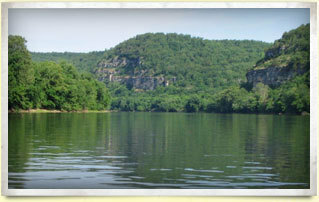 Our home water is the Little Red River below Greers Ferry Lake in Heber Springs, Arkansas. The Little Red River is a year-round, world-class, tailwater fishery that flows for approximately 82 miles before it meets the White River in east-central Arkansas. The constant 50-degree cold water from Greers Ferry Lake provides approximately 45 miles of some of the most productive trout water in the United States. The Arkansas Game and Fish Commission estimates 8,000 trout per mile; many of which are supplied by a year-round stocking program by the AGFC of Rainbow Trout throughout the Little Red River. There is some natural reproduction of Rainbow Trout in the Little Red River, so trophy Rainbow Trout are not a surprise! The coldest upper reaches of the Little Red River are also home to Brook Trout, and the Arkansas Game and Fish Commission’s Collins Creek project is a program designed to enhance the reproduction of Brook Trout in the Little Red River. German Brown Trout is certainly the crown jewel of the Little Red River. Mr. H. “Rip” Collins, for whom Collins Creek is named, caught a World Record German Brown Trout weighing 40 pounds and 4 ounces on the Little Red River in 1992! That fish was the third World Record German Brown Trout caught in Arkansas trout waters, and the record stood until 2009 when a 41-pound, 7.25-ounce Brown Trout as caught on the Manistee River in Michigan. There are no Brown Trout stocked in the Little Red River. All the German Brown Trout are entirely wild, and the population is self-sustaining. Is there another World Record Brown Trout in the Little Red River? Many fly fishermen of the river believe there is, and a few claim to have actually seen such trophies! To find out for yourself, book a trip with Empty Creel Fly Fishing Guides and Outfitter, and we will help to get your fly in the water.